Hybrid Log Gamma (HLG): The 4K HDR TV broadcast format explained | What Hi-Fi? While most AV fans embrace the picture quality improvements you get with HDR (High Dynamic Range) technology, most people could do without the brain-melting complexity and barrage of acronyms that come with it. Unfortunately, HDR has only got more complicated in the last couple of years, as we find ourselves having to get to grips with a wide range of HDR formats, from Dolby Vision to HDR10+, and Hybrid Log Gamma. It’s hard to think of a less friendly name for anything than Hybrid Log Gamma (which, for the sake of everyone’s sanity, we’ll refer to as HLG from here on in). Yet it’s a term that you shouldn't ignore if you're thinking about buying a 4K HDR TV. At its heart, HLG is mercifully more simple than it sounds. The result of a joint research project between the BBC in the UK and Japanese national broadcaster NHK, it’s designed to deliver a more convenient HDR solution for the broadcast world than the HDR10 system used by most current HDR sources and displays. Why is HLG more convenient? It combines standard dynamic range and high dynamic range images into just one video signal that can play as SDR on SDR screens, or HDR on HLG HDR-compatible screens, ensuring viewers aren't left in the dark, no matter what TV they have. These ‘one size fits all’ signals can be delivered in just one bitstream in the VP-9 or HEVC compression formats, or over HDMI; won’t eat up precious broadcast bandwidth in the way that separate SDR and HDR signals would; can even fit within the existing 10-bit production workflows broadcasters are already using. These are all hugely helpful features for broadcasters who may well, of course, find themselves needing to deliver HDR efficiently and consistently on live feeds. Hopefully you’re following so far, as there’s one more horribly technical phrase to introduce in order to explain how HLG achieves its seemingly miraculous triumvirate of broadcast HDR benefits: the Electro-Optical Transfer Function. Or EOTF for short. The simplest explanation for EOTF is that it defines the relationship between a recorded electrical video signal and image brightness. Video displays can then use this information to convert digital signal data into visible light. What HLG does is use a ‘hybrid’ EOTF that employs two different types of light coding. How can you watch HLG? So does this mean that HLG will work on any HDR-capable TV? Sadly not. An HDR TV will need to recognise the logarithmic curve HLG uses. The good news is that with live 4K broadcasts now gaining momentum, it's becoming imperative new TV sets support the technology. Most big-name manufacturers released HLG-compatible TVs in 2018, and Samsung, Sony and LG also have announced that their 2016-onwards HDR TVs will receive HLG support via a firmware update. Panasonic is offering the same for select top-tier 2016 and 2017 models, too, while selected models from Hisense, Finlux, Loewe, Philips and Toshiba also support the format. High-end projectors from Sony and JVC are also supporting the tech, such as the five-star Sony VPL-VW260ES and JVC DLA-Z1. 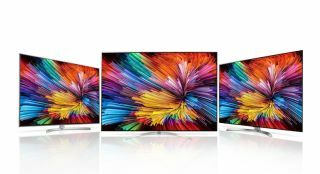 The trend has continued with 2019 4K TVs from LG, Panasonic, Philips, Samsung, Sony and more, all supporting the HLG HDR format. That said, it's worth noting HLG support shouldn't be taken for granted across the board - you're most likely to find its inclusion in a manufacturer's top-tier and flagship ranges than on the budget range, so it's worth delving into a TV or projector's tech specs to double-check. What HLG content is available? In the early days of HLG we only had demos shown at technology shows and press events to show us what HLG's potential could be. All that changed in December 2017, when the BBC launched the seven-episode Blue Planet II in 4K and HLG HDR on its iPlayer service. It was the first time a full series had been shown in both technologies - no mean feat, and it looked fantastic. It was a huge step forward from the four-minute clip of Planet Earth II to BBC iPlayer, which was streamed in 4K and HLG in December 2016. However, most people would have seen this 4K clip in SDR, as not many TVs at the time would have supported the HLG format. HLG updates were rolled out for a lucky few during the trial, though. Fast-forward to 2018, and BBC brought out the big guns. Along with trials of the FA Cup final, a rugby fixture, and the Royal Wedding (in conjunction with Sky), a majority of its matches from the 2018 FIFA World Cup and 2018 Wimbledon Champions were successfully shown live in 4K HLG on iPlayer. At its peak - on July 7th, for England v Sweden - the BBC reported an audience of 60,3000, with generally favourable responses regarding the 4K picture quality. It's worth noting that those without an HLG-compatible TV could still see the 4K stream. There were still some hiccups on the hardware side. Despite Samsung 2016 TVs promising HLG support, they don't support DVB-DASH, the technology standard behind the BBC's adaptive streaming. Similarly, Sony's 2017 A1 OLED isn't on the BBC's list of supported products, nor are a swathe of Sony's 2016 and 2017 line-up. What's the future for HLG? While HLG may be trickling rather than flooding onto our TV screens, there’s little doubt the BBC is intending to use it more and more – even if that’s more likely to be through iPlayer than live broadcasts for now. With the BBC's 4K trials getting such positive feedback - and the Beeb themselves have said all these trials so far have been a learning process towards future broadcasts - it's not inconceivable there will be even more big events being shown in 4K HLG soon.The 2019 Women’s World Cup? The 2020 Summer Olympics? Euro 2020? Elsewhere, Mediapro/Overon has announced it intends to transmit the Spanish Football League in HLG, while Google has stated that YouTube’s HDR videos will support HLG encoding. Digital UK included support for HLG in its 2017 specifications for its Freeview Play platform. Eutelsat's Hot Bird video service includes the HLG-enabled Travelxp 4K channel. And Sky has hinted HLG could form part of future HDR plans being studied for its Sky Q platform. Other HDR formats, such as HDR10+ and Dolby Vision, might be vying for your attention when it comes to streaming and discs, but HLG is still the one to watch when it comes to 4K HDR TV broadcasts.